Strawberries go on drinks, desserts, and the occasional savory dish, but did you ever think strawberries…. and fries? Fast food favorite Jollibee’s done exactly that with their newest release, Strawberry Fries. Weird combinations in fast food items aren’t new, and is arguably done for shock value than for the sake of actual flavor—but as open-minded folks deeply intrigued by its weirdness we just had to give it a whirl. Might this prove the existence of some magical harmony between berry and potato we just had never thought of? Like other flavored fries on the local chain’s lineup, the Strawberry Fries takes on the form of the Jolly Crispy Fries shaken with a flavored powder that’s only as natural as Cheez Whiz is versus true fromage, but this being fast food we’re embracing the fakeness of anyway. For this variant, the said powder comes with a salmon-pink hue that tints the base fries just slightly without turning it neon-pink as we had feared. But it felt wrong to have alongside our cheeseburger, bearing a strong, bubblegum-y aroma that reminded us more of candy and rainbows than it does our favorite salty side dish. Partly apprehensive but still with our curiosity at maximum peak, we pick up a fry and chew. First thing that hits your tongue is the powder, which carries the candy-like essence its aroma hints at with its sugary-sweet character. 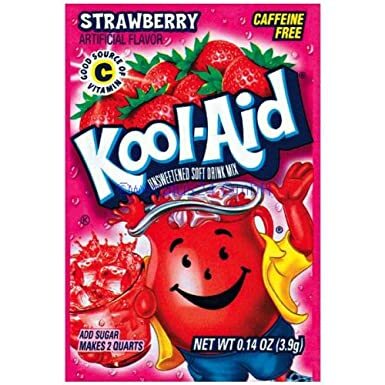 More specifically though, these treats deliver strawberry flavor in two ways: with an aromatic “strawberry-milk” note (think Strawberry Nesquick) that serves as the baseline, but also with mouth-puckering bursts of Kool Aid-like sourness that deliver excitement as it dissolves on the tongue. It oddly melds well with the spuds underneath, working synergistically with its saltiness, and the resulting combo of sweet, sour, and salty is one you might find familiar: think of Asian-style dried or pickled fruit (e.g., champoy or umeboshi) or even burong mangga. It’s as unusual as it is ingenious, with each part making itself heard while helping bring out the other parts, and the complex flavor wave keeps you on your toes fry after fry. Promoted in conjunction with the fries is the similar-veined Strawberry Tea Float, which is still primarily a gussied-up juice heavy on the sugar and only vaguely suggests tartness and bitterness to convey the strawberry and tea, respectively—but works when eaten along with the fries by helping even out its salty-sour qualities. We have to give it to the ‘Bee on this one—as skeptical as we were, they’ve managed to make strawberries and fries work in a way that offers a dynamic sequence of tastes which balance each other out, and delivered via the crispy-starchy comfort of our favorite fried potatoes. Had this and was pleasantly surprised by how I didn’t end up hating it. Not something I’d order again, but still not disgusting.